Flu season is quickly approaching, so it is time to have your Flu Shot! The Monmouth County Health Department (MCHD) will hold clinics over the next several months. Check our Calendar of Events regularly for additional clinics. Cost is $25 and Medicare is accepted. If you have questions, call 732-431-7456, ext. 8512. Senior Center - 6 Crawfords Corner Rd. Marlboro: Wednesday, 10/18/2017 from 10 a.m. – 1 p.m.
Allentown: Monday, 10/30/2017 from 10:30 - 11:30 a.m.
First Aid Building, 70 Waker Ave.
Avon: Wednesday, 11/8/2017 from Noon – 1 p.m.
Municipal Building, 301 Main St.
Farmingdale: Thursday, 11/2/2017 from 5:30 - 6:30 p.m.
Holmdel: Saturday 11/11/2017 from 8:30 – 10 a.m.
Public Works Garage, 14 Crawfords Corner Rd. Public Works Garage - Beers & Francis St.
Public Works Garage, 1400 Florence Ave.
Asbury Park: Saturday, 11/4/2017 from noon - 1:30 p.m.
Hazlet Township Saturday 10/14/2017 from 9 – 11 a.m.
Aberdeen: Wednesday, 11/8/2017 from 6:30 – 8:30 p.m.
Public Works Bldg., 147 Lenox Rd. Howell: Saturday, 11/02/2017 from 9 – 10:30 a.m.
*New clinics are added on a regular basis, so please visit our complete schedule often! Protecting your pet from rabies, in conjunction with regular veterinary care, is an important aspect in the health of your pets. The MCHD offers FREE rabies clinics throughout the year. One of the most frequently asked questions is about the duration of the vaccination. As in all vaccinations, the vaccine produces an immune response in the animal and it is the production of antibodies that provides the protection. The truth is the same vaccine is used for all vaccinations. The presence of the antibodies mentioned above is what determines the duration of the vaccination. If the pet is under one year of age OR has never been vaccinated before, the first shot is valid for a period of one year. Never having been vaccinated before, no antibodies have ever been produced and therefore no “immunity” exists. Every shot thereafter, unless advised by your veterinarian for other reasons, is valid for a period of three years. Because your pet had previously developed antibodies from the first vaccination, a three year “booster” will insure that your pet has continued protection. This three year duration is recognized by the State of New Jersey, even if your pets’ vaccination is not currently up to date. Finally, the State of New Jersey requires that the rabies duration be valid for at least 10 months of the municipal licensing year. For example, you will be required to show rabies immunity through October 2018 to obtain a municipal dog license for 2018. Diabetes is the leading cause of blindness in working-age Americans. According to the American Academy of Ophthalmology, approximately 29 million Americans age 20 or older have diabetes, but almost one-third don’t know they have the disease and are at risk for vision loss and other health problems. Early symptoms of diabetes are often unnoticed and vision may not be affected until the disease is severe and less easily treated. Diabetic eye diseases include diabetic retinopathy, cataracts and glaucoma. The most common of these is diabetic retinopathy, which affects 5.3 million Americans age 18 and older. Early diagnosis of diabetes and, most importantly, maintaining strict control of blood sugar and hypertension through diet, exercise and medication, can reduce your risk of developing eye disease associated with diabetes. Make an appointment for an eye exam today! Call your eye doctor or schedule a complete dilated eye examination with the MCHD at 732-431-7456, ext. 5. Eye exams are provided on the second Monday of each month. The MCHD is responsible for inspecting retail food establishments at least once a year. At the conclusion of the inspection, the establishment is given one of three possible ratings. A Satisfactory rating means that the establishment was found to be in substantial compliance with applicable regulations. If an establishment is found to be Conditionally Satisfactory additional inspections are required to address violations observed during the initial inspection. During the inspection process, we focus on food safety and handling, food protection including temperature control for both hot and cold products, cook temperatures, reheat and cool down procedures, hand washing and occasionally specialized processing and vermin control. An establishment receives a Conditionally Satisfactory rating when it is not in substantial compliance with one of the critical provisions listed above. Although cleanliness throughout an establishment is important, it is generally not the primary focus of an inspection. Occasionally an establishment experiences a condition which could result in an Unsatisfactory rating, which means that the establishment was found operating under grossly unsanitary conditions which would pose an imminent hazard. In this instance, the establishment would either voluntarily discontinue operation until the condition was addressed or be subject to closure by a court order. Our job as a Registered Environmental Health Specialist, commonly known as a Health Inspector, is to educate and enforce the current food laws and guidelines. 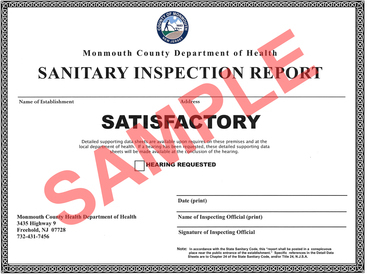 A listing of Conditionally Satisfactory establishments can be found at: https://mcapps.co.monmouth.nj.us/Web/HealthDept/RestaurantInspection.aspx. If you have any questions or concerns about an establishment call 732-431-7456, as it is our goal and obligation to keep our residents safe and healthy. The MCHD, in conjunction with our municipal partners, provided 2,584 free rabies vaccinations to dogs and cats in 2016.